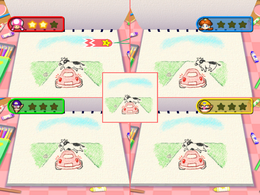 Picture This is a 4-player minigame found in Mario Party 7. The game's name comes from the phrase "picture this" which means "imagine this". The player is in a room, standing in front of a desk with the book on it. The camera then changes angles as the book opens to the first page. The characters all have their own picture books; in the middle of the screen is the exact same picture book. Once the game begins the book in the middle turns to a random page that is in the books the characters have. They then have to be the first to turn to that specific page and mark it with a bookmark. The player that marks the page three times is the winner. The pages in the book differ between each time the game is played. The pages in the book go in sequence that describe a story. There are three different animations: one is a driving car, another is a blooming flower, and the final is two snails caught in a thunderstorm. The winner performs their victory animation inside the room. Rules – "Turn the picture book pages to find the matching image. The first player to match 3 images wins!" Advice – "Press and hold or to turn the pages, or tap the buttons to turn them faster." The clock on the wall seen during the beginning and ending of the game is set to the internal clock of the console. This page was last edited on January 18, 2018, at 14:28.